Convene, a New York-based company offering flexible meeting and event spaces, has moved into a new space in Rosslyn. 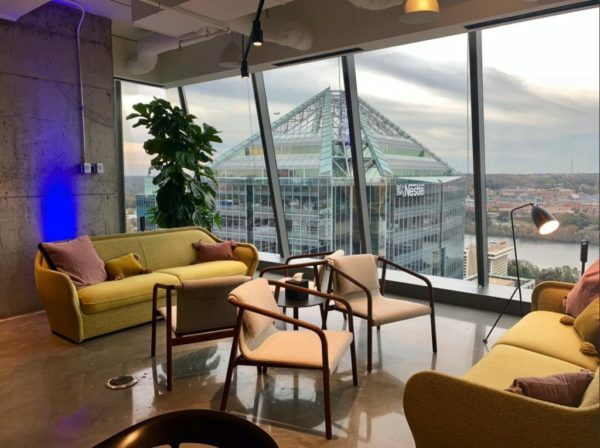 The Rosslyn Convene location opened last Thursday (Nov. 1), occupying the top two floors of the CEB Tower at 1201 Wilson Boulevard. Inside the new offices are full-service meetings and event spaces and amenity services for building tenants like research and advisory firm Gartner Inc., from whom Convene is subleasing the 35,000 square-foot space. The company offers flexible workspaces, but the focus of the new office is on providing spaces for building tenants. Convene will also manage a full-service culinary program, offering meals and pantry services to building tenants. The new occupancy comes at a crucial time for Rosslyn, which is in the process of reducing its 29 percent office vacancy rate with new tenants like Nestle and Cerner. Convene is signed to the space for 14.5 years. This is the second Washington, D.C. area location for Convene, which also operates a 15,000 square-foot location in Tyson’s Corner.